The SIMES Brick Light has been created to provide striking and eye catching wall illumination but with the same roughness and imperfections of the surrounding brickwork. As with clay bricks, every piece is different and processing and casting produces a unique imprint, the SIMES Brick Light has been created with the same process so each individual piece has an irregular glass surface allowing the luminaire to fit in with its natural surroundings. 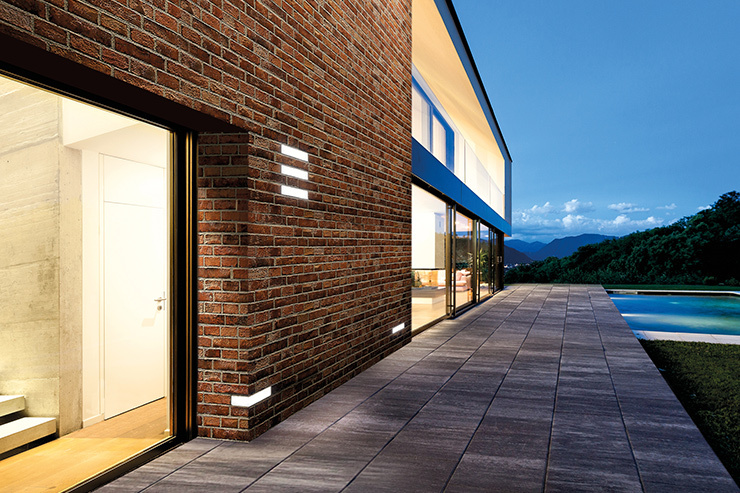 The Brick Light allows light to be transformed into a structural element and as well as taking on the form and dimensions of a brick, it allows for the same mode of handling, assembly and installation, thanks to its design and robust exterior. Brick Light is a full glass brick and its resistance has been tested to be 100N/ mm² while the normal clay brick is 60N/mm². Brick Light has dimensions of 5.5 x 12 x 25cm which allows for the luminaire to be easily adapted to most installations including smaller size brickwork as used in churches and cathedrals. Brick Light provides excellent, uniform light distribution (nominal flux 120 lm) on all of the 5 surfaces which allows the fitting to be perfect for a wide range of applications. The fitting is provided with a 5m cable and is not supplied with any housing which allows it to be an integral part of the construction. The fitting has an extremely long life however when the LED circuit comes to an end there are two options available, the original fitting can be turned into a decorative element or the Brick Light can be removed and replaced. Brick Light is also available as a stand-alone fitting with battery than can be charged with a USB which is provided. This version is also provided with a dimmer switch for dimming capabilities from 30%-70%-100% with 8 hours maximum power. The stand-alone version is 3kg in weight.